This poorly understood skin disorder affects the faces of at least 16 million Americans. Doctors don’t know the cause, nor is there any real cure. Rosacea begins with redness on the cheeks, chin, nose, chin, and forehead. Small blood vessels become visible on the face. Eyes become irritated and watery, with a burning sensation. As the disease progresses, bumps and pimples appear on the face. The skin thickens around the nose, causing it to appear more bulbous. From there, the condition may spread to the neck, scalp, ears, or even the chest. Rosacea is more commonly diagnosed in women. However, it’s men who tend to experience the most severe symptoms. There are several ways dermatologists commonly treat rosacea: dietary changes, antibiotics, topical skin medications, dermabrasion, and the like. 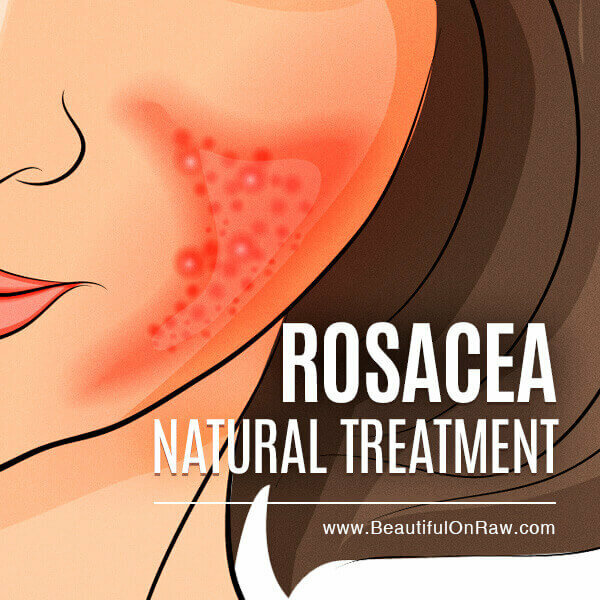 I never had rosacea, but I did a lot of research due to a request from my long-term friend. I read many testimonials of people who succeeded in curing rosacea. It comes down to this: just as acne, rosacea is an issue with the gut, not the skin. People report that there is a direct correlation between rosacea flair-ups and the foods they’ve eaten. Cut out sugar entirely, along with all forms of processed foods. Cultured foods. Try these recipes: Cultured Foods and Sweet and Spicy Cabbage Rolls. Begin a practice of daily juicing. More information How to Juice at Home. Intermediate Fasting. There is no better way to heal your digestive system than to give it a break. I believe the most effective and easy to follow of all types of intermediate fasting is Quantum Eating. I have been practicing it since 2006 with great anti-aging results. It’s very effective to keep my skin clear, smooth and supple. Eat anti-inflammatory foods. The best foods to eat to avoid triggering rosacea are: greens, berries, avocadoes, seeds (flaxseed, sesame seeds, pumpkin seeds and sunflower seeds are the best! ), papaya, pineapple, grapes. You should focus on eating anti-inflammatory foods—onions, tomatoes, carrots—and avoiding allergens, both of which will improve intestinal health. All your food should be organic. Use natural moisturizers, such as organic coconut oil and aloe vera. Try sea buckthorn oil. It’s know to be very effective in reducing redness and irritations. 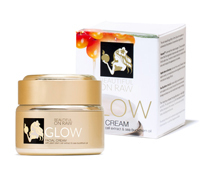 Our cream Glow contains sea buckthorn oil. More information on sea buckthorn oil benefits here. If you have rosacea, use a mild, non-abrasive cleanser, then rinse with lukewarm water, and finish with by patting your face dry with a soft towel. I cannot stress enough: Rosacea must be addressed internally. Simply controlling the symptoms and being super careful with your skin is not the answer. Get rid of it! Make sure you read my article: Sensitive Skin Care. Radiation... What Can You Do? What are Health Benefits of Nectarines?